Home America Biafra IPOB Nnamdi Kanu Referendum Religion THE FUTILITY OF TRUMP'S WARNING AGAINST THE KILLING OF JEWISH AND CHRISTIAN WORSHIPERS IN NIGERIA. THE FUTILITY OF TRUMP'S WARNING AGAINST THE KILLING OF JEWISH AND CHRISTIAN WORSHIPERS IN NIGERIA. I am quite disturbed that after the very strong warning that the American President Donald Trump gave to the president of the contraption called Nigeria, Muhammadu Buhari against the indiscriminate killing of Christian and Jewish worshippers in Nigeria during the meeting of both leaders in White House on the 30th of April 2018, without mincing words the US president made it clear that the American government is fully aware of the killings and persecutions of christian and Jewish worshippers in Nigeria, he made it very clear that America will not let that happen again and would really do something about it very soon. This statement by the American president obviously brought some form of succor to the millions of helpless Christian and Jewish people of Nigeria. But the question here now is, did the Nigerian president give any attention to that warning? The answer is NO. It is on record that on the night after the president Donald Trump's warnings, the Fulani herdsmen attacked and killed 10 persons in Benue State and since that day killings have continued unabated and even on a more pronounced pattern and scale. The most surprising is that the Nigerian Forces are now openly and directly involved in this barbaric act of persecution and oppression of all other religions aside from Islam. Today(Sunday, 13th May 2018), the Nigerian Police brutally attacked the Jewish worshipers who were praying in the house of the abducted leader of the Indigenous People of Biafra at Afaraukwu Ibeku in Umuahia in Abia State. A sane person would want to know what other interest the Nigerian government has in the vandalized home of Mazi Nnamdi Kanu who they abducted in his house during the military invasion of September 14, 2017. This question comes - was there any prohibition placed against people staying or assembling in that place? If the answer is NO, then what offense has the Jewish worshipers committed by going to pray for the leader of the Indigenous People of Biafra? Because there is no offense whatsoever except that the Nigerian government under the dictator Muhammadu Buhari has sent a direct message to America and President Trump himself that there is nothing America can do to stop the ongoing Jihad. It is indeed a very clear message that there is a very well organized plan to Islamise Nigeria. The jihadis already going on and the world should now see how the government has been aiding this Islamisation agenda, to the extent that the Nigerian Police now comes out openly to attack non-Muslims. The brutal attack on the Jewish worshippers today(Sunday, 13th May 2018) is a very big insult to the president of America, it will remain an insult to the American nation because as a matter of courtesy, the Nigerian government is expected to observe some restraints in the use of force against unarmed civilians, it is now obvious that the Nigerian government was not mistaken when they voted against the American government's decision to recognize Jerusalem as the capital of Isreal. This act alone clearly shows that Nigeria can never be the good friend to America. The Islamic Republic of Nigeria hates Isreal and any country that supports her, so there is no reason for Donald Trump to find friendship in Nigeria, it will be the colossal error to dine with the Islamic government of Nigeria and the arch genocidist Buhari himself. President Donald Trump should know that Buhari is not to be trusted and this latest assault on Jewish worshippers will remain a very strong evidence and proof for that. There is now a problem because if America cannot help the Christian and Jewish worshippers in Nigeria, then it means that the last resort which is self-defense will be activated because if the Nigerian government can consider the American government unfit to give such warning against the killing of Christians then it means that the persecuted people of this country should just wait for the upcoming ethnic and religious cleansing. Therefore, I am using this opportunity to remind the president of America that he should no more delay in helping the Christian and Jewish worshippers in Nigeria if actually he meant his words, and do it as a matter of urgency because time is seriously running out, and the plan to Islamise entire Nigeria is really becoming seriously pronounced, in fact, the whole plan is already being executed, hence, there is no point waiting for millions to be killed before America would do the needful. Meanwhile, we the Christian and Jewish people of the South East insist on the referendum to determine our future in Nigeria. 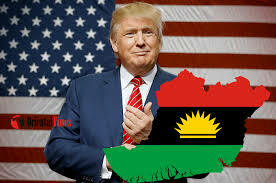 We are determined to go back to our original land which is BIAFRA and no amount of intimidation will stop our quest for Biafra, so now is the right time for the president of America to act, it should not be tomorrow because tomorrow may be too late.